A mother loves her son so much that she buys him a woolly red hat, a mouse, new shoes and a variety of other gifts from the practical to the fanciful. Wherever the boy goes, he takes each gift with him, piling one on top of the other until the inevitable happens. With each new gift, the story of past gifts are repeated. Rhyme and repetition of each item as one more is added makes the story fun to read aloud. The illustrations by Kevin Hawkes are the perfect compliment to the fun, joyful spirit of the story. The boy is energetic and playful as he discovers the world around him. Illustrations of animals and different seasonal activities as well as a visit with the boy's grandparents are all activities create a feeling of wonder and warmth. Author and illustrator do an excellent job at combining everyday activities to which children can relate to more fantastically fun. 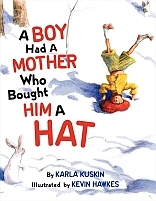 A BOY HAD A MOTHER WHO BOUGHT HIM A HAT is a wonderful book for a mother to share with her son(s) but don't let the title fool you. I read this book aloud to my husband who loved it. A BOY HAD A MOTHER WHO BOUGHT HIM A HAT is also a book fathers might also enjoy sharing with their children and grandchildren too!